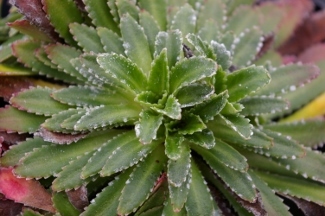 Joy Creek Photo Archive (c) all rights reserved (The species Saxifraga longifolia is an alpine plant ranging from the Pyrenees Mountains of Spain down to the Atlas Mountains of North Africa. As its name suggest, it has long leaves which make it desirable for its larger size. However, the species is monocarpic, which means that it will die after it blooms. Also, because it rarely makes off-sets, the species is easily lost in the garden.) Saxifraga x longifolia (hybrid) is a hybrid of unknown origin that we purchased from Wild Ginger Farm. We were amazed by its vigor and the size of its slightly concave leaves. We were also excited to know that, because of its hybrid parentage, it is not monocarpic and produces lots of offsets. This is an eye-catching plant for a container or a rockery. Individual rosettes measure more than 5 inches in width. The dark green leaves are lime-encrusted along their margins. This has never bloomed for us so we are guessing at a bloom time based on our research. Summer. 2-3 in. x 10 in.